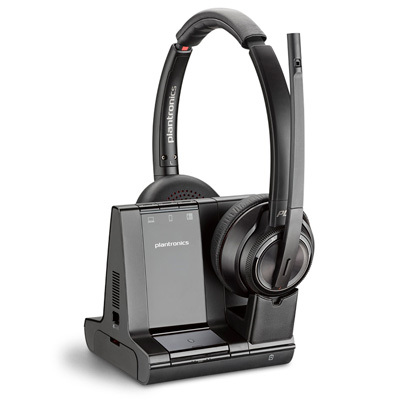 Plantronics made a surprise announcement to distributors today that we are happy to share. For no additional cost, the portable work-anywhere W440 wireless headset for softphones will soon come with a battery that has an on/off switch. The new battery lets you turn your headset off when it’s not in use to save battery life. 8/4/15 update: Plantronics will be discontinuing the original battery, and the new battery with on/off switch (PL-204755-01) will be replacing it Fall 2015. You can work anywhere with Savi W400, as long as you are using a softphone. W400 series do not connect to land line desk phones (like W700 series) – they communicate with a USB adapter (pictured below) for PC softphones. When you leave the current battery (that has no on/off switch) attached to the headset while traveling it is always searching for the base, and wasting battery life. For road warriors the on/off switch on the new battery will save a lot of communication hassles caused from a dead headset. You can also accomplish the same thing by simply removing the battery from the headset when you travel. Plantronics part numbers for W440 wireless headsets will change to denote the new battery, but BTP model numbers will remain the same: PL-W440, PL-W445, PL-W440-M, PL-W445-M, PL-W740, PL-W740-M, W745-M, W745 and W745-M. We expect to receive our first shipment of W440s with the new battery included next week. 8/4/15 update: the new battery will be available as an accessory for Savi W740/745, and in the Fall of 2015 it will be included with W740/745. The part number for the new battery with on/off switch is PL-204755-01 and it is $39.95, a $5 increase over the current battery (PL-84598-01).